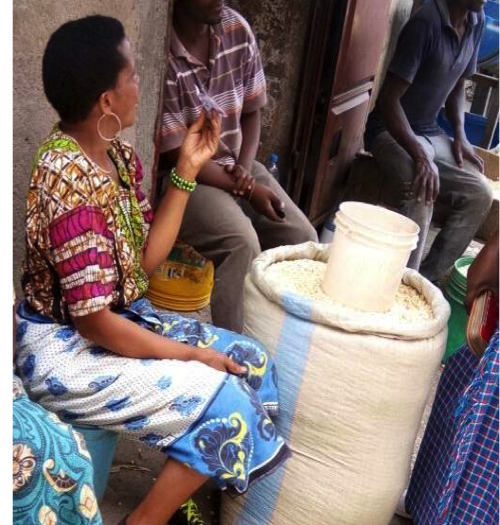 Vicky tells us that her current supply of maize has come from Babati and it is fresh and the kernels full. She has many long term customers to whom she sells 4kg measures (sados -Sadolin being the name of the paint manufacturer whose tins she uses). She sits next to the maize grinder and so an ideal place to catch shoppers looking to buy the staple diet. It is a long way away from the difficult times when she had to get up before dawn to collect her allocation of green vegetables that she took by bus (1 hour) to the central Arusha market. Here she would trade them for other vegetables (tomatoes, onions and potatoes) that could be sold in Ngaramtoni; she needed to be back early to sell her stock at the morning market and then when she had sold her vegetables she would have to go up the mountain again to find another source of green vegetables for the next day. This was tiring work with very little return as the prices were set by the farmers. Now Vicky can afford to keep some stock in the local store and when the next harvest time comes she will hope to buy a larger stock at the lowest price. She is now thinking about increasing her stock and including millet which is very popular at the moment being made into a nutritious porridge or used to make beer. With hard work she has been able to see her children through school and her eldest child is at Technical College studying building skills. If you would like to help support more women like Vicky, we are currently raising funds for our next round of grants and loans. To help us achieve our target you can donate here.